You need to be resonsible how and where you build your fires. Always build them safely or the result will be a fire you can not contain. OK, OK, not a revolutionary break-through, but it can't be beat and I never leave home without one. I used to wrap a rubber band around the top of the lighter and underneath the gas valve button to keep it from discharging in my pocket. Few things are more worthless than an empty lighter! All lighters now have an idiot proof safety mechanism that requires adults to seek the assistance of a child to operate! That's right, waxed paper. You've got a roll of it in the back of one of your kitchen drawers where it was left behind by cling wrap, Tupperware, rubber-maid, zip-lock bags and Aluminum Foil. (the capitalization denotes the high regard with which outdoors-men should hold Aluminum Foil - don't leave civilization without some - but I digress!) Waxed paper can be folded up so that it takes up no space. It can be refolded and used as a cup. There are other uses, but the point here is fire. Fold a piece of this in half then fold back each "half" like making paper dolls. When half way stretched out, a view of the end should look like the letter M or W. Lay the paper down so that the two "ridges" of the letter M form a valley. Into this valley place your magnesium shavings and/or other kindling. Set this on fire and break out the vitals, Granny, Jethro's got an appetite tonight! This stuff is commercially available for about four dollars. It comes in a tube like toothpaste, but smells like Johnson's Paste Wax. It probably tastes like it too, so don't brush your teeth in the dark! Smear Fire Paste on a stick, roll the stick so that the paste is on the bottom, and light the paste. Next lay the stick on top of half of your kindling. Then cover with the rest of your kindling. The kindling on the bottom will be ignited as the hot burning paste drips off the stick. This stuff will make even damp wood dry out and burn. 6. Hexane , & misc. other commercial fire starters. These are all functional, and some are better than others. Compact collapsible "stoves" are available for use with the Hex and Triox Tablets. Unless you have a good supply of these don't try to cook with them, use them to start a "real" fire. The stoves that are available for these are little more than fixtures to keep the cup or pan off the tablet. One tablet will boil a cup of water, but won't heat a meal. Here's a better idea: With a stick or knife gouge or cut a trench about an inch wide and about two inches longer than the diameter of the base of your cup or pan. This will be a miniature fire pit. Light a tablet and place it in the center of the trench. Place the item to be heated on top of the trench. By adjusting the size of the trench and moving the cup or pan, you control the draft and thus the burn rate of the tablet. The main problem with the stoves provided for the tablets is that the tablet burns out of control and typically flames shoot up well past the rim of the container being heated. This is a waste of the little amount of fuel that you have. 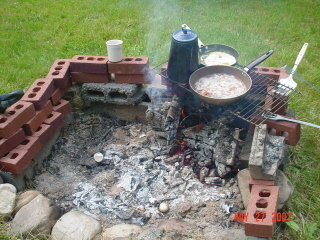 A tablet in a fire pit can burn two to three times longer than one on a "stove", and can heat about twice as much water or food. In a pinch I have snuffed out a tablet in the trench and placed it in a plastic bag for use a second time! If you really want a stove to provide your heat consider one by Sierra. My buddy got one. I berated him soundly. I told him he was getting soft. He did have to go to a larger pack to haul it, but I must admit, if you're going to wuss-out and go with a stove (stoves are required in areas that do not allow open campfires) this is the one to get. It has a three speed blower powered by an AA battery. (the same size battery as your Mini-Mag - use that same battery size in all the gear you buy) The air is forced through an ingenious baffle arrangement between the inner and outer walls of the burning compartment. This preheats the air for the combustion allowing more of the volatile gasses to be ignited. I was going to build one, but that baffle design has me stumped and my buddy knows better than to loan his to me. In any case, they're only about $35.00 and do not require costly fuel or fuel bottles. Just build a fire inside using any of the above methods, allow heat to build up for a moment or two then turn on the blower. Within minutes you'll have a stove that will boil water in four minutes and will digest WET fuel without hesitation. Fuel can be anything organic - twigs, sticks, pine cones, moss, leaves, paper, cardboard, cloth, etc. Use caution when burning pine cones, this stove is capable of such intense heat that the pitch in the cones can explode from the heat before the cone "burns down". Be ready for some snap, crackle, and pop!